Middle Eastern black metallers Al-Namrood from Saudi Arabia have just announced the release date of their new full-length album “Heen Yadhar Al Ghasq“. The album will be released once again by Shaytan Productions and it will come in two versions. On January 6th 2014 it will be released in CD edition limited to 500 copies and on January 14th 2014 it will become the first album of the band that will be also released on vinyl, limited to 300 copies, featuring a full color jacket with black vinyl. Both versions are already available for pre-order at their label’s official page. 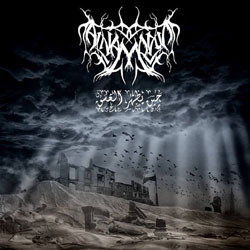 Al-Namrood, the elusive nomadic revolutionaries continue to wage war with their 6th Arabian black metal release, intoxicating exoticism and intense usage of the Arabian language. “Heen Yadhar Al Ghasq” translates to “When Dusk Appears” and consists of 7 tracks, 40 minutes long. As the band’s theme remains articulating insurgency and rage, the composing of this record is tend to be more intensive, exotic and maintaining the Middle Eastern atmosphere. Al-Namrood always take an honor to imperil the life to convey the most seditious music in a exact opposing region, which in turns, keep the band motivated and stirred to burst more wrath. The wonderful cover artwork is already revealed, as well as the album tracklist. In their official Stereokiller page you can listen to a song from the upcoming album.